Unfortunately, HD Tune does not generate any fancy independent graph outputs in particular, so I just took a screenshot of the program. Like our HD Tach results on the previous page, the line was a bit bumpy, but remained fairly flat on average. It differs slightly in magnitude than the other program -- probably due to testing algorithms used -- but its performance characteristics are identical in practice. 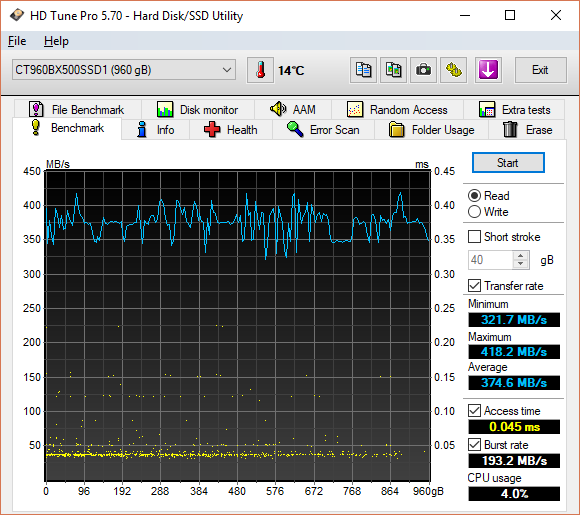 Other than that, the results were commendable across the range; the recorded access time was very low, as we would expect from a solid state drive. The Crucial BX500 960GB posted an average of 374.6MB/s for its sequential read speed, which is slightly below the BX500 480GB. Do keep in mind the discussion we had on the previous page, as it still applies here. posted 3 hours and 28 minutes ago, with 1 posts. posted 3 hours and 28 minutes ago, with 2 posts. posted 3 hours and 29 minutes ago, with 8 posts. posted 3 hours and 29 minutes ago, with 7 posts. posted 3 hours and 30 minutes ago, with 7 posts. posted 3 hours and 33 minutes ago, with 15 posts. posted 3 hours and 33 minutes ago, with 59 posts. posted 3 hours and 34 minutes ago, with 14 posts. posted 3 hours and 34 minutes ago, with 11 posts.